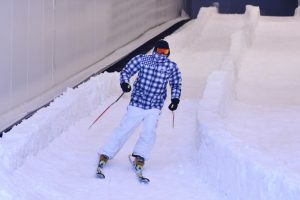 What do you do if you’re part of an Olympic ski team that needs a tunnel to practice in during the summer? You find a refrigerated parking garage, of course. Believe it or not, such a thing exists and the U.S. Nordic combined team really did practice there before this year’s Olympic games. It’s in Slovenia, which wanted both an indoor ski tunnel and a parking garage (who doesn’t?) but didn’t have room for both. Solution: Build a refrigerated garage and truck in snow so skiers can practice on its ramps. Read more about it and check out photos and videos here.